It’s important to be ready for anything. Financial experts advise you to have a rainy day fund to cover unexpected expenses, but there’s much more you can do to make sure you’re ready for emergencies. Here are five ways you can make sure you’re ready for whatever the future brings. Learn CPR and first aid. You never know when those skills might be needed. Accidents can happen at any time, even when you’re at home just enjoying a quiet evening. When you have these emergency skills in place, then you can take steps to save a life while you’re waiting for emergency responders. Even if you don’t live near the water, it’s also wise to know how to swim. Sign up for a class at your local recreation center or community pool. There are swim instructors in NYC and other big cities that specialize in teaching adult safety swimming. These skills could save you in a hurricane or flood. You may have a fire extinguisher sitting on top of the refrigerator in your kitchen, but do you know how to use it? In an emergency, you won’t have time to read the directions, and every second will count. With fire extinguishers, remember to PASS. Pull the pin out, Aim the nozzle at the fire, Squeeze the trigger, and Sweep the spray back and forth across the flames. Remember, fire extinguishers have a shelf life. Many people don’t think about this because they sit for years and years unused. Look at your extinguisher to find out the date that it is good till. The country is plagued with an aging infrastructure. You can lose the power in a storm or because a transformer went bad. It only takes a few hours for the food in your refrigerator to start thawing and going bad. Protect yourself and ensure that you’re ready for power loss by investing in a generator. A portable one will work provided you have extension cords, or you can have an electrician create a permanent connection between the generator and fuse panel. When bad storms roll through, do people in your area swarm the supermarkets and empty the shelves? Society doesn’t have to collapse as we know it for you to have an emergency and need extra food and water in the house. Power outages and storms can put your shopping plans on hold. 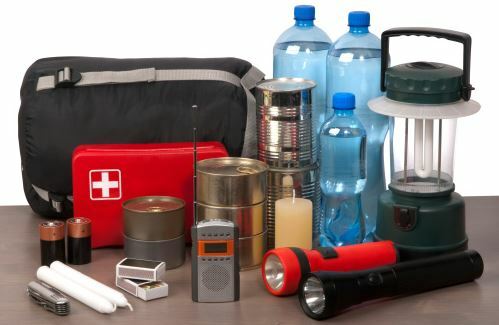 You’ll be ready if you’ve been stocking up on canned food and bottled water. Check the expiration dates and rotate the food to keep old items towards the front. Use and replace the products regularly so that you’ll always have a good selection of safe food and water. When a storm is on the horizon and officials are calling for an evacuation, you need to be ready to secure the house. This is not the time to go to the store and try to buy plywood because they’ll be sold out. A better option is to have pre-cut and drilled plywood stored in the garage or a shed. When there’s a natural emergency and you need to block the windows, you’ll already have the necessary supplies. Being prepared for an emergency can save your life. It can help you avoid the mobs of people rushing out for supplies, and it can mean the difference between life and death in a medical emergency. Follow these steps to ensure that you’re ready when it matters the most.